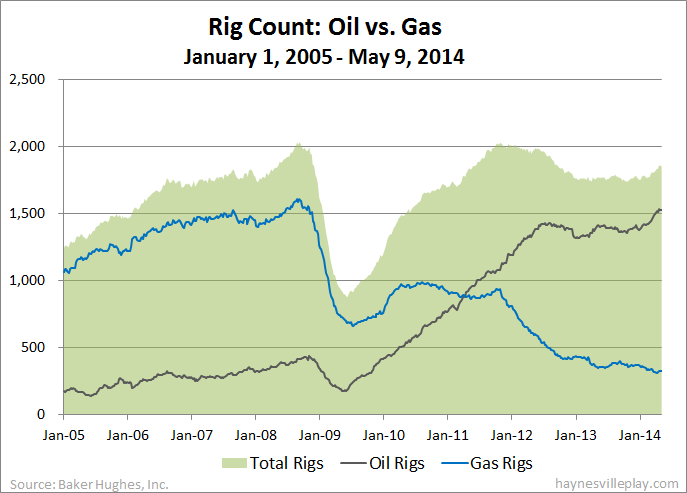 The Baker Hughes U.S. rig count was up nine this week to 1,866. Oil rigs were up eight to 1,536, gas rigs were up one to 326 and miscellaneous rigs were unchanged at four. By type, horizontal rigs were up eight to 1,251, vertical rigs were down six to 403 and directional rigs were up seven to 212. Among gas rigs, horizontal rigs were down one to 239, directional rigs were up five to 60 and vertical rigs were down three to 27. The EIA reported that working gas in storage was up 114 Bcf last week to 1.38 Tcf. The weekly injection was 30% higher than last year (+88 Bcf) and 23% above the five year average (+93 Bcf). The current storage level is now 35.2% below last year (2.128 Tcf) and 40.1% below the five year average (2.302 Tcf). The Haynesville Shale rig count was up one last week to 26. Louisiana was down one to 17 (Anadarko shifted a rig back to Texas) and Texas was up two to nine (in addition to Anadarko shift, Valence added a rig). I updated the rig count map too. Baker Hughes announced that the U.S. rig count was down four to 1,857. Oil rigs were down three to 1,528, gas rigs were down one to 325 and miscellaneous rigs held at four. By type, horizontal rigs were down five to 1,243, vertical rigs were up three to 409 and directional rigs were down two to 205. Among gas rigs, horizontal rigs were up three to 240, directional rigs were unchanged at 55 and vertical rigs were down four to 30. The EIA reported this morning that working gas in storage was up 106 Bcf to 1.266 Tcf. The weekly injection was 18% greater than both last year and the five year average (both +90 Bcf). The current storage level is now 37.9% below last year (2.04 Tcf) and 42.7% below the five year average (2.209 Tcf). 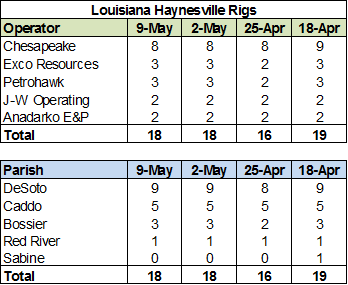 There was no change last week in the Haynesville Shale rig count, as Louisiana held at 18 and Texas held at seven, for a total of 25. The Baker Hughes U.S. rig count was up six this week to 1,861. Oil rigs were up three to 1,531, gas rigs were up three to 326 and miscellaneous rigs were unchanged at four. By type, horizontal rigs were up five to 1,248, vertical rigs were up two to 406 and directional rigs were down one to 207. Among gas rigs, horizontal rigs were up two to 237, directional rigs were down four to 55 and vertical rigs were up five to 34. 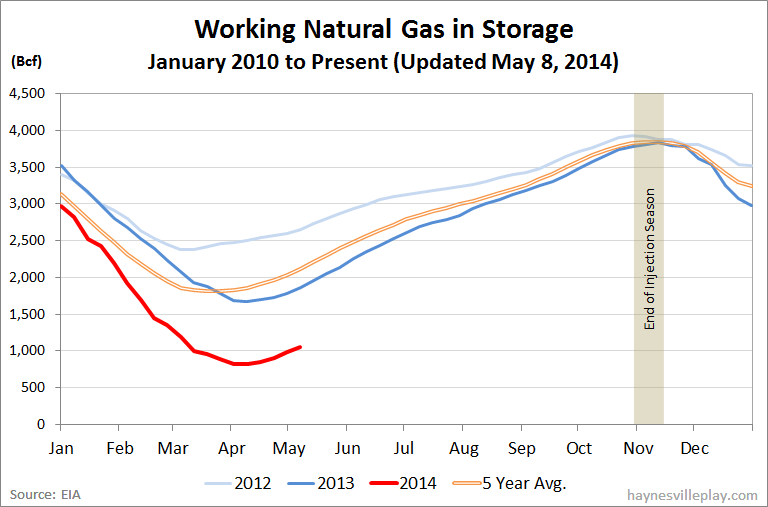 The EIA announced this morning that working gas in storage was up 105 Bcf last week to 1.16 Tcf. The injection was 7% greater than last year (+98 Bcf) and 28% above the five year average (+82 Bcf). The current storage level is 40.5% below last year (1.95 Tcf) and 45.3% below the five year average (2.119 Tcf). Actually, the headline should read, "Sabine to Buy Forest," but technically it will be a merger. Sabine Oil and Gas announced last week that it has entered into a definitive merger agreement to combine with Forest Oil in an all stock transaction to create a new entity with Sabine owning 73.5% of the new entity and the Forest shareholders owning 26.5%. The transaction itself is a little complicated but it basically allows Sabine to buy Forest and become a publicly traded company while still being managed by Sabine's executive team and controlled by private equity company First Reserve (Sabine is currently privately held and is the former NFR Energy). Here's the presentation. Forest's prospects have dimmed over the past several years, as reflected by its stock price, which dipped from the upper $20s in the first half of 2011 to $1.79, the day before the deal was announced. The combined Sabine merges acreage positions that are fairly similar, as both have holdings in East Texas and the Eagle Ford Shale. The East Texas holdings for both company are their largest acreage positions and are somewhat commingled. The Eagle Ford positions do not overlap. In terms of Haynesville activity, neither company has run a rig in the play for quite some time (Forest last ran a rig in April 2011 and Sabine in Jan. 2012), but Sabine has completed a small handful of wells over the past six months. As the slides below show, the combined company does plan some activity in E. Texas this year, even in the Haynesville Shale, but the risk/reward economics are better right now in the Cotton Valley Sand. The Haynesville Shale rig count was unchanged across the board last week with only few minor movements. The count stuck at 25, with Louisiana and Texas holding at 18 and seven, respectively. Interestingly, the only two new Louisiana completions reported liquids. The Anadarko well was unspecific for both oil and gas, but the EP well, which was a recompletion from almost two years ago, reported both gas and condensate. The Baker Hughes U.S. rig count was up one this week to 1,855. Oil rigs were up one to 1,528, gas rigs were unchanged at 323 and miscellaneous rigs were unchanged at four. By type, horizontal rigs were down four to 1,243, vertical rigs were up eight to 404 and directional rigs were down three to 208. Among gas rigs, horizontal rigs were down two to 235, directional rigs were up four to 59 and vertical rigs were down two to 29. 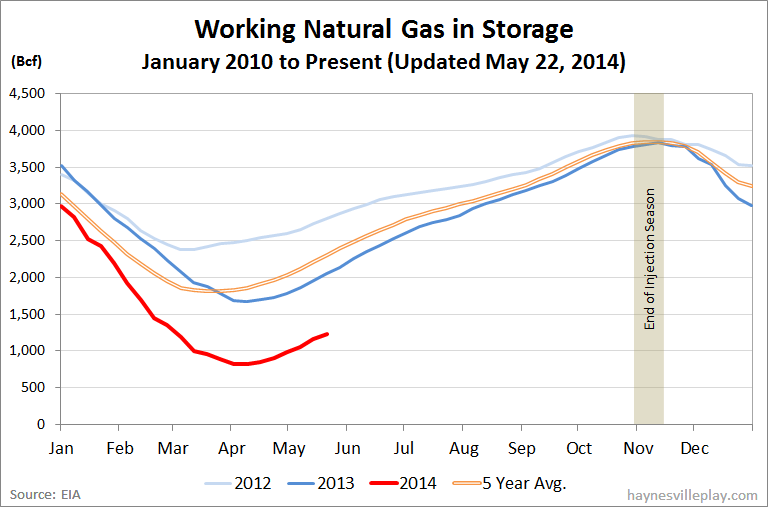 Working gas in storage is back to being measured in Tcfs instead of Bcfs. The EIA announced this morning that gas in storage was up 74 Bcf to 1.055 Tcf. The injection was 9% lower than last year (+81 Bcf) and 3% above the five year average (+72 Bcf). The current storage level is now 43.0% below last year (1.852 Tcf) and 48.2% below the five year average (2.037 Tcf). The Haynesville Shale rig count was up one this week to 25. 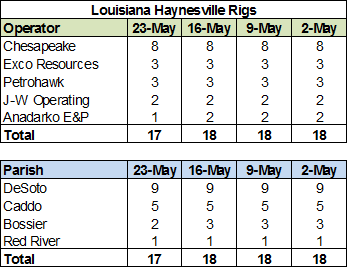 Louisiana was up two (Petrohawk and EXCO) to 18, while Texas was down one (Anadarko) to seven. To paraphrase the Disney movie "Frozen," for the first time in forever, Anadarko and Panola Co. are not at the top of the Texas rig count list. Panola's benefactor Anadarko has been gradually drawing down its rigs from the Texas side of the Haynesville Shale since the beginning of February 2014, decreasing its count from six to two. The company has been running a rig in the Louisiana Haynesville for about a year and is now up to two in the Caddo Pine Island field. The Baker Hughes U.S. rig count was down seven this week to 1,854. Oil rigs were down seven to 1,527, gas rigs were unchanged at 323 and miscellaneous rigs held at four. By type, horizontal rigs were up two to 1,247, vertical rigs were down two to 396 and directional rigs were down seven to 211. Among gas rigs, horizontal rigs were down one to 237, directional rigs were unchanged at 55 and vertical rigs were up one to 31. The EIA reported this morning that working gas in storage was up 82 Bcf to 981 Bcf. The injection was double last year (+41 Bcf) and 41% greater than the five year average (+58 Bcf). The current storage level is now 44.6% below last year (1.771 Tcf) and just under half the five year average (1.965 Tcf).